CRIME, GUNS, AND VIDEOTAPE: Sig Shakes up the Sub-Compact Pistol World at the SHOT Show Yet Again. Sig Shakes up the Sub-Compact Pistol World at the SHOT Show Yet Again. 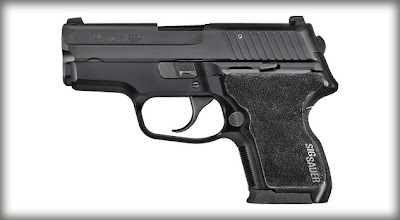 Las Vegas, NV—The Sig Sauer Exhibit at this year’s SHOT Show had another compact surprise! One of my blog visitors wanted me to do a piece on yet another gun being released. I foolishly passed on taking a second look that the gun because of a personal bias against most polymer frame guns. This all black gun had that familiar look from the distance. Boy was I wrong! The P224 is simply a cut down larger frame P229, making yet another terrific hideout gun. This can be obtained on .40 S&W or .357 Sig. This is small enough to look like a mouse gun but looks are deceiving. This gun packs a real punch. Thanks Paul. I can't wait to see this. I like you, am not a fan of plastic in my pistols. I have a Kahr PM 9mm , it has the polymer, but it is a pleasure to shoot.They are pricey.